Moto X Pure edition (left) and OnePlus 2 (right). London-based technology writer who edited Sam Mobile, a news and community website dedicated to Samsung mobile devices. Please note that newer versions of both of thee phones have been released and so we present this comparison for those who are considering buying an older/used phone. The time has finally arrived when we no longer need to spend top dollar to get a high-spec smartphone anymore, and we would like to thank Chinese OEMs for that. If it wasn’t for them, we would not be able to buy premium class hardware for less than $400. They priced their flagship devices for far less money, compared to high-end phones from established smartphone manufacturers like Samsung, HTC, Apple, and more. But to be fair, even though they had amazing specifications, the software experience was usually terrible and super laggy, and the build quality of the actual device wasn’t that great either. Nevertheless, their devices have greatly evolved, both in terms of software and build quality, and are now on par with devices from other giant companies. In 2015, a plethora of sub-$400 smartphones were released by numerous smartphone vendors, but there were two particular handsets which caught our eye, the OnePlus 2 and the Moto X Style/Pure Edition. So today, we're going to compare both of them and, hopefully, help you decide which one’s best for you. Let’s start with the amount of money you’ll be paying. The base model of the OnePlus 2 starts at $329, which gets you 16GB of internal storage and 3GB of RAM, while the $389 variant is equipped with 64GB of internal storage and 4GB of RAM. The Moto X Pure Edition comes in three storage configurations — 16/32/64GB — and all three variants are equipped with 3GB of RAM. The base model costs $399 and each storage bump is an additional $50 on top of the original price. So here’s the thing: with the OnePlus 2, you need to get the higher-end, 64GB model as it doesn’t have expandable storage and you get an extra gigabyte of RAM, and 16GB is nowhere near enough these days. Whereas, with the Motorola phone, we would recommend you to get the standard, 16GB model as it does have a MicroSD card slot for expansion. Moreover, if you really want to opt for a higher storage capacity, we would still encourage you to buy a memory card instead, as you would get more gigabytes per dollar. So, that’s done; the pricing is out of the way now. The OnePlus 2 is packing a 5.5-inch Full HD (1920x1080) LTPS IPS display with a pixel density of 401ppi. On the other hand, the Moto X Pure Edition features a 5.7-inch Quad HD (2560x1440) IPS display panel with a pixel density of 520ppi. You might think that QHD resolution is enough to choose the Moto X Pure Edition over the OnePlus 2, but that’s just a single variable in a pool of variables. On paper, the resolution difference does seem substantial but it’s not that big of a deal in real world usage, as the pixel density is incredibly high for your eyes to see pixels on either of these displays. The key factor which makes or breaks a display’s quality is the panel itself and the OnePlus 2 boasts a superior panel with deeper blacks, brighter whites, and no brightness leaks. Temperature-wise, it’s a bit on the cooler side but Oxygen OS allows you to manually adjust the color balance, which is a nifty feature as you can set the color temperature according to your personal preference. We found the panel on the Motorola to be a tad warmer and its software only allows you to switch between two color presets: Normal and Vibrant, and doesn’t give you manual control over color balance. Both displays aren’t 100% color accurate and look a bit washed out to us, but they are the best ones you can get for this amount of cash. Even though both devices sport different screen sizes, the actual footprint of the smartphones is relatively similar to each other. The Moto X Pure Edition is slightly taller and a tad wider but it’s also rocking a larger display than the OnePlus 2, giving it a higher screen-to-body ratio. Furthermore, technically, the OnePlus 2 is lighter — 175g — and thinner — 9.9mm — than the Moto (11.1mm, 179g) but due to a generic, flat design it actually feels heavier and thicker. I would say the Moto X Pure Edition has a much more ergonomic and beautiful design; it’s slick and has a curved back, and I found the weight to be very well-balanced as well. The OnePlus 2 is the complete opposite of that. It’s a bit taller than smartphones with its screen size and that’s mainly because it’s boasting a fingerprint sensor below the display; it takes up quite some space, and to balance the design OnePlus had to increase the top bezel as well. Motorola doesn’t have a removable back cover, while the OnePlus does and it’s removable mainly to insert your SIM cards — yes, cards, OnePlus packs in dual-sim support — and swap out the back covers to change the look and feel of the device using company’s StyleSwap covers. And their StyleSwap cover range includes Kevlar, Rosewood, Black Apricot and Bamboo, each back cover will set you back $26.99. Speaking of customizing the device, Motorola actually lets you custom make the X Pure Edition using its Moto Maker service; you can truly make the smartphone your own. It allows you to choose between the front panel and frame colors, different types and colors of backs (Soft Grip, Wood, and Leather), accent colors, and you can even engrave the back. However, keep in mind that some options will cost you additional cash. Moreover, it has water repellant nano-coating (IP52 certified), so it’s resistant to minor spills and splashes. The Moto X PE is sporting front-facing stereo speakers with SmartBoost technology and they are pretty good. While on the OnePlus 2 there are two speaker grills on the bottom, one grille is for the microphone and the other grille is for the speaker; it only has a single, mono speaker and you can really output some quality audio out of it if you optimize it with the integrated Audio Tuner. There’s also an Alert Slider on the left side of the OP2, which allows the user to toggle between three sound profiles: normal, priority, and silent. In terms of processors, the OnePlus 2 is boasting a higher-end, eight-core Snapdragon 810 chip with an Adreno 430 GPU, while the Moto X Pure Edition is packing a six-core Snapdragon 808 silicon with an Adreno 418 GPU. Both are 64-bit enabled and built on a 20nm process. Despite the fact that the OnePlus 2 has two more cores than the Moto X PE, the performance is identical; maybe even better on the Moto. Applications launch and load slightly quicker on the Motorola by a few milliseconds. These chips will run anything you’ll throw at them, it doesn’t matter if they are CPU intensive apps or graphic heavy games; neither would break a sweat. However, I found the user interface to be more responsive and smoother on the Motorola in everyday usage, when compared with the OnePlus 2 — I would like to give credit to Motorola’s well-optimised software for that. Out of the box, both devices ship with a non-skinned version of Android 5.1.1 Lollipop; it just feels and looks like stock Android on a Nexus device. The biggest difference here is the feature set between the two operating systems. OnePlus 2 comes with the company's own Oxygen OS which allows the user to customize the OS by changing icons, accent colors, and enable system-wide dark mode. It has the ability to switch between software navigation bar and physical buttons, and you can assign long press and double tap actions to each capacitive key; it makes them more functional. There’s a built-in file manager and an Audio Tuner, which is powered by Waves MaxxAudio and allows the user to toggle between audio preset right from the volume panel. There are also various on-screen gestures, which allows the user to perform some tasks — like open the camera, turn on flashlight and more, with a single gesture while the screen is turned off. Furthermore, it comes with App Permissions, a feature introduced in Android 6.0 Marshmallow and brought to Lollipop by OnePlus, which allows the user to grant or restrict access to certain parts of the smartphone to applications. On the other hand, Moto’s OS comes with only a handful of features including Moto Assist, Moto Action, Moto Voice, and Moto Display. Moto Assist allows the user to set locations and activities which then the app uses to make changes to the device. For example, you can set the device to automatically turn on Wi-Fi and disable mobile data whenever you enter your house. Moto Action performs certain actions when the device is moved in a specific motion. Moto Voice is Motorola’s version of Apple’s Siri. Sure, Oxygen OS has a plethora of features, but I have to say that OnePlus’ OS is still immature and isn’t rock stable, you’re destined to find a few bugs here and there. But the company has been regularly releasing software updates every month with bug fixes and enhancements. Time to talk about the camera now. 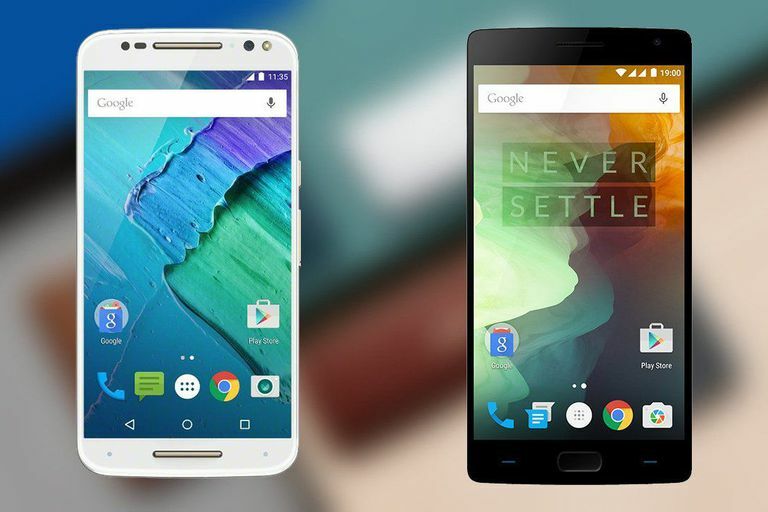 The Moto X Pure Edition is sporting a 21 megapixel, whereas the OnePlus 2 is packing a 13-megapixel sensor. Both sensors boast an aperture of f/2.0, are capable of shooting 4K (2160p) at 30FPS, Full HD (1080p) at 60FPS, and Slow-Mo (720p) at 120FPS, and are accompanied by a Dual-LED flash. There’s also a laser auto-focus system onboard on the OnePlus 2 which helps the device to focus on objects faster than Motorola’s Phase Detect Auto-Focus (PDAF). OnePlus’ sensor contains large 1.3µm pixels and is also equipped with Optical Image Stabilization (OIS). Quality-wise, you might think that the Moto X Pure Edition will win as it has more pixels — well, you would be wrong. Despite having fewer megapixels, the OnePlus 2 has a superior sensor than the Moto. It has a higher dynamic range, produces way better low-light pictures with considerably less amount of noise, picks up highlights better, and produces overall rich colors. It was a similar story with videography, but OnePlus’ aggressive focus jumps make videos from the device a bit jaggy. In terms of stock camera applications, Motorola’s app is pretty outdated and has one of the worst user interfaces of a camera app, while OnePlus’ app isn’t great either, it’s way better than Moto’s offering. It also comes with a manual mode which gives the user control over shutter speed, ISO, white balance, and focus. As far as the front-facing camera goes, both offer a wide-angle 5-megapixel sensor, however, the Moto X Play Edition also comes with a LED flash to help you with those late night selfies. It also comes with a Night Mode and can shoot Slow-Mo video as well. OnePlus’ software only has beauty mode for the front-facing camera and it makes your face look like an oil painting. Both smartphones feature adequate call quality and do a great job at canceling out background noise. Both support dual-band Wi-Fi 802.11ac, Bluetooth 4.1, GPS + GLONASS and 4G LTE. There’s no NFC on the OnePlus 2, so you won't be able to use Android Pay on it. OnePlus was the first company to equip its device with a reversible USB Type-C connector; technically it’s still USB 2.0, and doesn’t support Qualcomm QuickCharge. Whereas, Motorola is rocking the good old MicroUSB 2.0 connector for syncing and charging the device, and it does have TurboPower for fast charging and comes with a 25W charger. The OnePlus 2 is packing a 3,300mAh battery, while the Moto X Pure Edition features a 3,000mAh battery. Both will give you an all-day battery life with the OnePlus giving a screen-on time of around 3 hours and 45 minutes, while the max you will get out of the Motorola is around 3 hours and 15 minutes. It takes more than 3 hours to fully charge the OnePlus 2, as it doesn’t support QuickCharge. The Moto charges to 100% in under 2 hours, and a 30-minute charge gives you around 50% of juice. Neither of them supports wireless charging. The OnePlus 2 and Moto X Pure Edition are two very capable smartphones for less than $400, neither are perfect, each has its own pros and cons. There's one catch with the OnePlus 2 though, you can’t really buy it as it requires an invite, but you can buy a Moto X Pure Edition from Motorola's website or from a network carrier right now. The Moto X Pure Edition is for you if you do a lot of media consumption, while the OnePlus 2 is an overall better smartphone in many aspects. However, if you think that you absolutely need NFC and fast charging on your phone then it’s a deal-breaker. In the end, it all comes down to personal preference. It doesn't matter what smartphone you choose to go ahead with, We can assure you that you'll be satisfied with either of these two devices.